With the weather here in Kentucky being cold, cold, cold, the guinea pigs wanted to talk about how they stay healthy and happy in the winter. 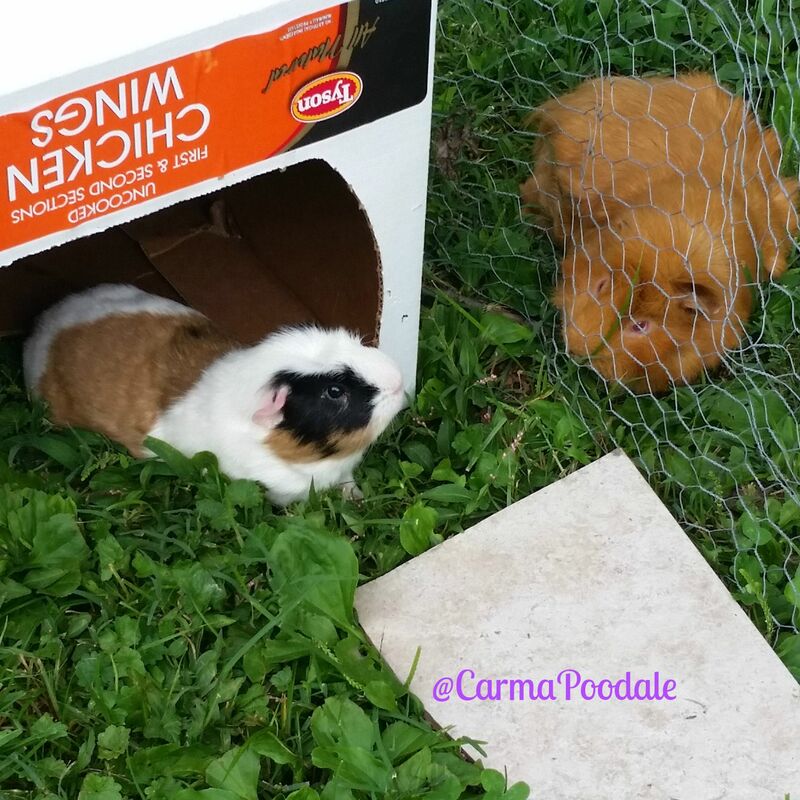 Our piggies love to go outside when the weather permits. They love to nibble grass and just soak up some sun. They also like to walk around a lot. One of the things that make ma cringe is when she sees small cages being sold for guinea pigs. 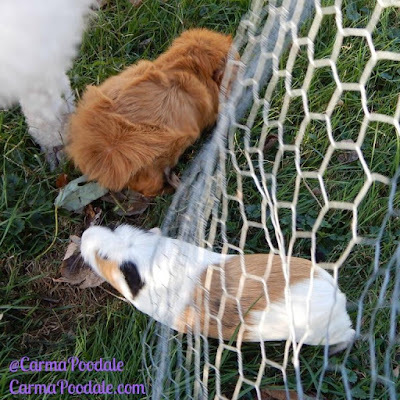 It is recommended that a cage to be 30" X 36" for just 1 guinea pig. 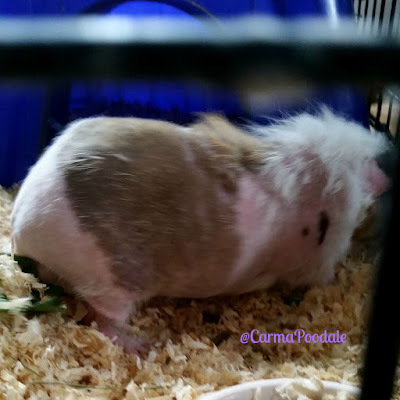 Guinea pigs need to have space to walk around their cages. When we picked up Cookie from the vet office to foster, she could barely walk. She had been shaved because she suffered from fleas and mites. The vet took care of the pests and when she was given a clean bill of health, we took over. Cookie was okay while you were holding her but catching her was a different story. Cookie's 1st day here. She refused to look at the camera. Fast forward to today and she is a happy , healthy, trusting guinea pig. She doesn't try to get away when you reach in the cage nor does she wheek like you are going to hurt her. It has taken months to get her where she is today. We feed the guinea pigs a healthy diet , plenty of timothy hay and fresh veggies. Over the summer, Cookie got to use her legs more than she probably ever has. Ma said she just didn't walk right. To ma this was a sign that Cookie was kept in a cage that was too small. When piggies don't have the space to walk around, their muscles don't work properly. Just like if you sit in a chair all the time and never walk. You lose that muscle. Ma would exercise Cookie while outside. She would keep moving her box around her playpen area and Cookie would walk to go under the box. In a hours time , ma would move the box to each corner which was 4 times. Cookie's playpen area is 6'x6'. This really helped to build Cookies muscles and her confidence. She wasn't as scared being outside because she knew she had shelter. Cinnamon taught her how to get under the pen to break out. They kept me busy watching them both. They would play follow the leader games with Cinnamon being the leader. This was great exercise for both of them. 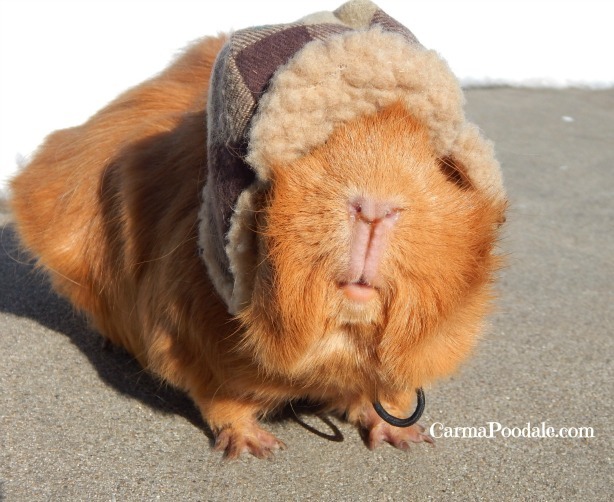 How do we keep our guinea pigs active in the wintertime when it's too cold to go out? We still want the piggies to socialize and exercise. 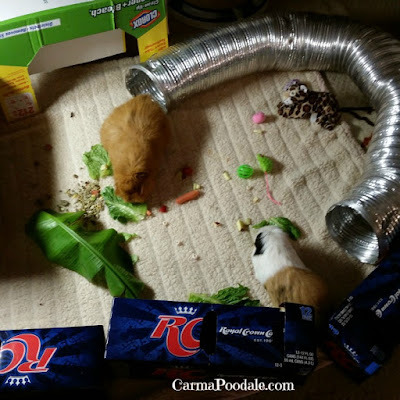 We build them a inside piggie playpen! It is stuff that we have sitting around the house too. It doesn't take much to make guinea pigs happy. The one thing that really makes them happy is to be socialized. They are part of the family too. They get family time 4-5 days a week and other days they get picked up and loved on. Lots of kisses happen in this house. Ma puts down a soft blanket first. She puts fresh veggies and some guinea pig food on the blanket. We get our boxes from Sam's Club but sometimes we get them from the pet store. Any box that makes a nice house will do. The tube is a aluminum tube that is used for dryers or air ducts. Its important to make sure there are no sharp edges on the entrance of the tube. 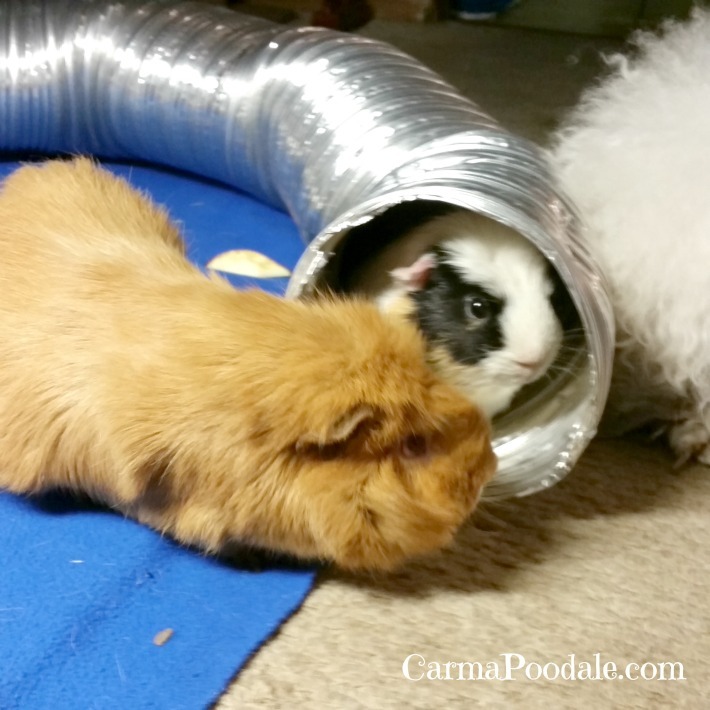 That tube is the guinea pigs FAVORITE! They will run in and out of it constantly. You never know which end they will come out of. Ma just lines the outer part with empty RC boxes. It shows the guinea pigs what their boundaries are. When Cinnamon gets tired of playing, he will push the boxes out of the way and walk back to his cage. Ma has a empty toilet paper roll in their cage waiting for them. 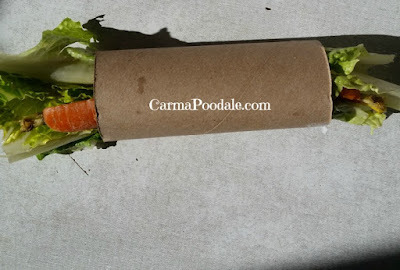 She fills it with leaf lettuce, carrots and small bits of celery and sometimes tomato bits inside. It gives the piggies something to entertain them in their cages. They like to chew the toilet paper roll too. It helps to keep their teeth filed down. 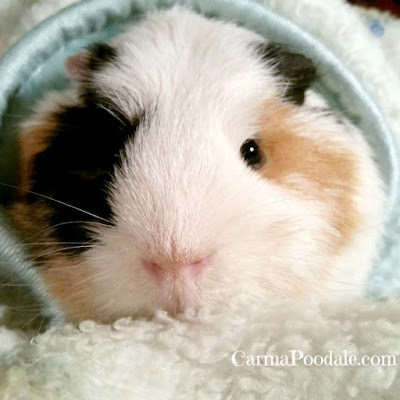 After the piggies get tired of playing in their play area, they both get some individual snuggle time. It helps them to relax before bed. They have already had a lot of stimulation so the snuggle time helps them to be calm. With a face like this, you want to give them all the love and attention that you can. Cookie has came a long way since we first got her. She makes Cinnamon happy because he has someone to talk to when he is in his cage. They live in separate cages that sit side by side. That is how we keep our guinea pigs healthy and happy. We hope you have a wonderful Wednesday! I love the tube idea! We have a bunny and she has never lived in a cage either. Lulu lives in an extra bedroom. She likes cardboard boxes, too. When ma had her rabbit he had the run of the house. At night he would sleep inside a dog kennel that was covered with a blanket. He liked his cubby and would go in it by himself. When he didn't want to sleep in his cubby , you would find him sleeping on the couch or the dog bed. Cinnamon and Cookie are very lucky guinea pigs! So many great ways your ma uses to keep them healthy and happy! Sometimes ma says they are more of a adults pets than a child. They sure do love cuddling and playing. We all look forward to when the piggie playland gets set up. We all including Molly get to socialize with them. They are adorable and obviously well loved! I love that idea of HVAC tubing! I would have never thought of that. Very clever! It is a great addition to the playland. You can buy all sizes to fit what your small animal needs. Even rabbits can use it to play in. I know they have a great time running back and forth in it. Whoa...that was fascinating. I had no idea! I have to say that I'm in love with Cinnamon! Cookie is fantastic as well. This is a great post, such helpful info. You take such great care of your piggies!